The “Ridvan message” for 2013 is now available in English (click here). This message of the Universal House of Justice, addressed to the Bahais of the world, is released every year during the festival of Ridvan, when Bahais celebrate the twelve days that Baha’u’llah spent in the garden of Ridvan, on the outskirts of Baghdad, in 1863. The message has an important role in setting the focus and tone of Bahai activities around the world in the following year, and is sometimes used to announce significant developments. Noora Nabilzadeh ( نورا نبیل‌زاده) and Sanaz Tafazzoli ( ساناز تفضلی ) were transferred from Vakil Abad prison in Mashhad, where they are in the serving sentences in the wing for prisoners of conscience, to the offices of the Ministry of Intelligence on May 1. No reason was given. The agents said they were being taken to the Ministry’s facilities for 10 days. Sanaz Tafazzoli will complete her 6-month sentence on May 5, but it appears she will not be released. Noora Nabilzadeh is serving a 5-year sentence on charges of blasphemy and spreading the Bahai Faith. She was arrested while playing music for the children in an orphanage. The report would be difficult to summarise, so I will leave it with my recommendation, and a link to the full story. The results of the election of the nine members of the Universal House of Justice have been announced. Those elected for the next five-year term are Paul Lample, Firaydoun Javaheri, Payman Mohajer, Gustavo Correa, Shahriar Razavi, Stephen Birkland, Stephen Hall, Chuungu Malitonga, and Ayman Rouhani. Of these, Chuungu Malitonga, and Ayman Rouhani are new members: both are Counsellors serving at the International Teaching Centre. This means that, as in previous years, all members of the Universal House of Justice are drawn from the corps of Counsellors at the ITC. Elham Ruzbehi (الهام روزبهی), a Bahai living in Isfahan, reported to Semnan prison with her baby on April 27, to begin serving her 2 year sentence. She is the fourth Bahai mother who is serving her prison sentence with her baby. She was arrested, with several other Bahais, on March 12, 2011, following a search of her home and the seizure of some of her personal effects. She was pregnant at the time. She was freed on bail one month later. She was sentenced to 3 years of prison, which was reduced to 2 years by the court of review. She has been living in Isfahan for more than one year, but has had to go to Semnan prison. Muhammad Hussein Nakh`i ( محمد حسین نخعی ) and Golrokh Firuzeyan ( گلرخ فیروزیان ) have been released, from Birjand and Semnan prisons, respectively. Mr. Nakh`i, who is 87 years old, lives in the village of Khusef, near Birjand. He was Iran’s oldest prisoner of conscience. He was detained on May 14, 2012, and sentenced to one year in prison, a fine of 6 million rials (360 euros; 500 US dollars), and a five-year suspended sentence, on charges of propaganda against the regime in the form of teaching the Bahai Faith, and membership of the Bahai community. He has completed the one year in prison. Golrokh Firuzeyan was arrested by the Ministry of Intelligence in Semnan on March 12, and released on bail on Spril 25. Bail was set at 100 million tumans (62,000 euros, $US 81,000). The son of Riaz Sobhani ( ریاض سبحانی ), who was arrested in June 2011 and is imprisoned for assisting the work of the Bahai Open University (BIHE), has told the International Campaign for Human Rights in Iran that his father’s physical and mental condition has worsened in prison. His father is 67 years old and suffers from heart disease, a lung disease and stomach bleeding. He is serving a four-year sentence in Raja’i Shahr prison, in Karaj, near Tehran. In May 2012 he was hospitalized because his heart condition had become acute. Na’im Sobhani, his son, who lives in America, said that the medical officer had authorised two months leave for his father, but he was only granted six weeks. During these six weeks he had medical tests. Two weeks ago he had to return to prison. Since then, the family in Iran have seen his mental condition deteriorate sharply and he is suffering more pain. It is very hard for him, given his age, and the prison conditions are intolerable. Last year he was hospitalized for constriction of the arteries and had surgery. Two days later he was back in prison, which meant that he could not be under medical observation. His condition worsened day by day until the medical officer granted him two months leave. Conditions in Raja’i Shahr prison are very unsanitary. There are 4 or 5 prisoners in each two-person cell, so they share a bed, or it is given to someone who is old or sick. Each prisoner has just one blanket in the winter. The washing facilities are filthy and the food is bad. There is nothing to be done about, because, basically, they are not considered human. Ardeshir Fena’eyan (اردشیر فناییان), a Bahai who was arrested in Semnan on February 12, was released on bail on April 10. He was held for 68 days in the Ministry of Intelligence facilities in Semnan. Bail was set at 50 million tumans (31,000 euros, US$41,000). Seven Bahais from Gorgan, and one from Tehran, were tried in Tehran on April 24. The charges were “organising and running an illegal organisation, membership of an illegal organisation, and propaganda against the regime.” All eight have been held in Raja’i Shahr prison, near Tehran. Their names are Farhad Fahandezh, Fahrmand Sana’i, Siamak Sadri,Kamal Kashani, Fu’ad Fahandezh, Kourush Ziari, Payam Markazi and `Adel Na`imi ( فرهاد فهندژ، فرهمند ثنایی، سیامک صدری، کمال کاشانی، فواد فهندژ، کوروش زیاری، پیام مرکزی و عادل نعیمی). Mr. Na`imi is from Tehran, the other seven are from the Gorgan region. They were among about 20 Bahais who were detained in a wave of arrests on about October 17. (Kourush Ziari is from Gonbad-e Qabus, where he was arrested and later transferred to Gorgan). After some weeks in detention in Gorgan, all seven were transferred to Evin prison in Tehran for interrogation, after which they were sent to Raja’i Shahr prison. Navid Keyhanirad ( نوید کیهانی راد ), a Bahai student doing an Master’s degree in software engineering at the Sharif Technical University of Shiraz, has been expelled because of his religion, although he was one of the top postgraduate students. He graduated with a Bachelor’s degree at Shiraz TU in June 2012) [It would appear that the ban on Bahais entering higher education in Iran, is not always considered to apply to technical studies at a lower level ~Sen]. As he was the top student, he should have been able to gain a place at Sharif University (in Tehran). But officials prevented him sitting the entrance examination, so he continued his studies in Shiraz. He was able to enroll there without sitting the entrance examination because there is a quota for top students. In December 2012, at the end of the first term, the university security office summoned him and questioned him about his Bahai beliefs. They told him that he would be barred from the university, beginning on the following day. He was however treated with respect by the university’s guards, because the saw that in filling in the application form he had told the truth [That he was doing advanced studies, not lower-level technical studies]. He was not given copies of his qualifications. Panidh Fazl `Ali ( پانید فضل علی ), a Bahai student of Industrial Engineering, has been expelled from the University of Science and Technology in Tehran. He discovered he had been expelled on February 23, when he accessed the university’s web site. Next day he went to the University’s office of educational administration, where he was informed verbally that he had been expelled because of his Bahai beliefs, that the decision had been made by the national body overseeing educational assessments (the Sanjesh), and that no written evidence of the expulsion would be given. He was in term 6 of the programme, and had excellent grades. The first trial date for `Adnan Rahmat-Penah ( عدنان رحمت‌پناه ), a Bahai from Shiraz, was set for April 16, but no trial was held because he was not transferred to the court from the prison. His family’s enquires to the officers who bring prisoners to the court resulted in various answers, such as ‘his name was not on the list.’ Another officer said that three other names were missing from the list, but those prisoners were taken for trial. After some discussion between the family, their lawyer and the judge it was decided that another trial date would be set next day, on April 17. But when the family arrived at court, they were sent to the office of the prison. They asked why `Adnan had not been sent to the court, and were told “We got the message from the court, but we didn’t want to send him.” The strange this about this is, why would the prison officials contravene the order of the court and judge? Are they ridiculing the court, or was it a deliberate ruse to put `Adnan under psychological pressure?`Adnan’s brother Eyman ( ایمان رحمت پناه ) was one of a groups of Bahais who were arrested in Shiraz early in March 2012. Egypt’s Ministry of Insurance and Social Affairs has barred the Bahai community from receiving foreign funding. Counsellor Mohamed El-Demerdash, legal advisor to the Ministry, revealed this during a discussion of the NGO law in the Shura Council, saying that the Ministry has recently discovered the existence of foreign funding for some NGOs and groups with objectives that flout society’s rules and morals, such as supporting Bahai thought. Mona Amri Hesari and Rufeya Pakzadan ( مونا امری حصاری و روفیا پاکزادان ), two Bahai women living in Gorgan who were arrested on March 18, were released on bail on April 1. They had been held in Amir Abad prison in Gorgan for 24 days. They have been charged with membership of Bahai organisations, teaching the Bahai Faith, and communicating with foreign governments. Bail for Rufeya Pakzadan was set at 100 million tumans (62,000 euros, $US81,000), and for Mona Amri at 150 million tumans (93,000 euros, $US122,000). On October 17, 2012, security forces in Gorgan arrested 17 Bahais in a series of coordinated and sometimes violent raids on Bahai homes. Six of these arrestees, and one Bahai from Gonbad who was already being held at that time, were transferred to Raja’i Shahr prison, near Tehran. The conditions in Semnan Prison’s special wing for women where Bahai prisoners are held are unbearable. The food is very bad, and since glass was found in some of the food, many of the prisoners have refused to eat prison food. Since they are not allowed to buy food directly from the prison shop, and have to make generally inferior purchases of leftovers from the men’s wing, many of the prisoners go to sleep hungry. Among those affected by the poor quality of the food are three women with nursing babies. In this prison — the Central Prison of Semnan — prisoners are not separated according to the charges against them, so the Bahai women are held with thieves, drug addicts, murderers and foreign nationals. The Bahai prisoners also have to sleep on the floor of the common area, due to lack of space, which gives a sense of insecurity, especially for those with infants. Recently, on Children’s day, the Women and Children’s Protection Society distributed a grant for children in prison, but the Bahai women with children were not included, because of their religion. Iran Human Rights includes Faraz Ruhi ( فرزاد روحی ), a Bahai, in a list of prisoners held in section 350 of Evin Prison, in Tehran. Since his arrest and sentencing was not previously reported on Sen’s Daily, I’m mentioning it here. According to the reports, he was arrested at Villa Shahr in Isfahan on August 5, 2010, and is serving a sentence of 3.5 years on charges of propaganda against the regime and insulting Islamic sanctities. The pressure on Bahai prisoners in Semnan prison has been increased recently. The efforts of the prisoners and their families to raise the issue with prison officials and the Ministry of Intelligence have been fruitless. The Bahai prisoners are denied access to the prison yard, the library, the gymnasium, the prison shop, the telephone and are separated from the other prisoners. Great care is taken to see that they have no contact with other prisoners. The Bahais have been denied the right to telephone their families, on the orders of security officials. Many restrictions are applied in a discriminatory way to the Bahai prisoners, to an extent that their families describe as violating their human dignity and civil rights. In the past year, more than 25 Bahais have served all or part of their sentences in the central prison in Semnan. The full text of this report lists their names and current status (in Persian). The sisters Nava and Nika Khalusi ( نوا و نیکا خلوصی ) have been freed on bail, after 185 days in ‘temporary detention’ in Mashhad. They were detained by security forces on September 26, 2012, and held for two months by the Ministry of Intelligence, before being transferred to Vakil Abad prison near Mashhad. The bail was set at 3 billion rials (191,000 euros, $US 244,000). A bush fire that started around 6pm on Thursday 28th, close to the Bahai temple in Panama, burned through the night but was largely quelled by 7.30 am on Friday. Firefighters are still working on two fire fronts, and have not yet made any deductions about the cause of the fire. There are walking trails in the area around the temple. Behfar Khanjani ( بهفر خانجانی ), a Bahai from Semnan who is serving a four-year prison sentence there, has been struggling with a medical condition for some years, but the Prosecutor and state-appointed doctor have refused permission for him to receive treatment. His condition has been exacerbated by the stress of the past 2 years in prison, and the lack of a suitable environment there. He has been allowed only a few days of leave from prison, too short for an observable improvement in his condition. Behfar Khanjani is serving a 4 year sentence for membership of illegal Bahai groups and attending Bahai prayer meetings and the 19th-day ‘Feast.’ He was arrested on January 6 2010, after a search of his home by agents of the Ministry of Intelligence. He has also been the target of two arson attacks on his home using Molotov cocktails. He was among the Bahais who were pressured by agents from the Ministry of Intelligence for more than four hours on December 4, 2012, to give “interviews” for television. While he has been in prison, his sister and wife have also been interrogated. The Willmette Institute has announced a groundbreaking online course on the Persecution of the Iranian Baha’i Community, designed for those who want to work more effectively in the field of human rights, and for those who want to study academic and human rights literature on this topic. Two leading Iranian human rights activists, Ahmad Batebi and Fariba Davoudi will accompany Farhad Sabetan and Kavian Milani in teaching this course. It has been designed to be of interest to the NGO community, university students, informed citizens and those who want to get active in this arena. Mona Amri Hesari and Rufeya Pakzadan ( مونا امری حصاری و روفیا پاکزادان ), two Bahai women living in Gorgan who were arrested on March 18, have been charged and, on a judge’s orders, transferred to Amir Abad prison in Gorgan. On October 17, 2012, security forces in Gorgan arrested 17 Bahais in a series of coordinated and sometimes violent raids on Bahai homes. Six of these arrestees, and one Bahai from Gonbad who was already being held at that time, were transferred to Raja’i Shahr prison, near Tehran, where they are being held in ‘temporary’ detention (see the previous report on this blog). Others have apparently been released, since Mona Amri Hesari and Rufeya Pakzadan are reported to be the only Bahais in prison in Gorgan at present. The Universal House of Justice has sent Naw Ruz greetings to the Bahais living in Iran, and to “all the pure spirits among the people of Iran.” The message compares the spring season to the spiritual spring, brought by the Bab and Baha’u’llah, which promises the collective maturity of the human race and carries the diverse people and nations towards a world characterized by the principle of unity in diversity. The full Persian text and an approximate translation are in the documents archive of my Bahai Studies blog. Mona Amri and Rufeya Pakzadan ( مونا امری و روفیا پاکزادان ), two Bahai women living in Gorgan, were arrested in their home by security forces at 11 a.m. this morning (March 18). It is not known where they are being held. Navid Khanjani ( نوید خانجانی ), a Bahai human rights activist and the founder of the PCED (Campaign against Educational Discrimination), has been severely beaten by warders at Tehran’s Evin Prison. He is serving a 12 year sentence in Raja’i Shahr prison, near Tehran, on charges of spreading propaganda (an activity which the IRI itself engages in), disturbing public opinion, propaganda against the regime in the reports and interviews of foreign media membership of the central committee of the CHRR (Committee of Human Rights Reporters), and founding the PCED. He was summoned this morning to go to the Tehran revolutionary court, and when he refused to wear a prison uniform, the guards beat him severely. It is not known why he was summoned to the court. Ten Bahais associated with the Bahai Open University (BIHE) appeared at the Public Prosecutor’s office in Tehran on March 12. A previous report stated that only six had been summoned for trial. They are named as Babak Beheshti, `Abas Ta’ef, Hassan Momtaz, Negin Qadameyan and the four previously named: Azita Rafi`zadeh, Peyman Kushkabaghi, Nazanin Niku-Sarasht, Nasim Baqeri, Talu` Golkar and Ahmad Golzadeh ( بابک بهشتی،عباس طائف،حسن ممتاز، نگین قدمیان، آزیتا رفیع‌زاده، پیمان کوشکباغی، نازنین نیکو سرشت، نسیم باقری، طلوع گلکار و احمد گلزار ). After presenting their defence, they were released on bail. Justice for Iran has named 15 individuals prominent in the persecution of the Bahais in Iran, and/or prominent in spreading the anti-Bahai ideology, and “requests that the European Union (EU) and countries supporting human rights use political and diplomatic means to apply pressure on the IRI to end the persecution of Baha’is and include the names of these fifteen human rights violators in human rights sanctions, including instituting travel bans against them and freezing their assets.” In addition to prominent government figures, the list includes Hossein Shariatmadari, Editor-in-Chief of Keyhan newspaper. Justice for Iran’s plea is accompanied by documentation and historical background regarding the rise of anti-Bahaism in Iran and its consequences for the Bahai minority there. – Asadollah Jafari, Prosecutor of Mazandaran Province, where anti-Bahaism and the prosecution of Bahais for crimes of conscience is particularly rife. – Seyyed Reza Musavi-Tabar, Prosecutor of Shiraz, and responsible for Detention Centre 100, where many Bahais have been held. He condemned Raha Sabet to 3 years in solitary confinement. A new 48-page report documents the rising tide of violence directed against the Iranian Baha’i community, and the degree to which attackers enjoy complete impunity from prosecution or punishment. During the period from 2005 through the end of 2012, the Baha’i International Community has documented 52 cases where Baha’is have been tortured or held in solitary confinement while in detention. Another 52 incidents where Baha’is have been physically assaulted—sometimes at the hands of officials and sometimes at the hands of plainclothes or unidentified attackers—have also been documented, as have some 49 incidents of arson against Baha’i homes and shops, more than 30 cases of vandalism, and at least 42 incidents of cemetery desecration. Yet in none of these incidents have attackers – whether government agents, local officials, or plainclothes or otherwise unidentified individuals – been prosecuted for their crimes. Golrokh Firuzeyan ( گلرخ فیروزیان ) has been arrested, after having gone to the court in Semnan on March 9. She has been handed over to the Ministry of Intelligence. She is from Semnan, but has been living in Tehran. For some weeks the Ministry of Intelligence in Semnan has been holding her sister Shidrock hostage, and threatening the safety of her family in Semnan. Six Bahais associated with the Bahai Open University (BIHE) were summoned to appear in court in Tehran on March 12. Their names are given as Azita Rafi`zadeh, Peyman Kushkabaghi, Nazanin Niku-Sarasht, Nasim Baqeri, Talu` Golkar and Ahmad Golzadeh ( آزیتا رفیع‌زاده، پیمان کوشکباغی، نازنین نیکو سرشت، نسیم باقری، طلوع گلکار و احمد گلزار ). In the 24 days since Shidrokh Firuzeyan ( شیدرخ فیروزیان ) was arrested in Semnan, her family has been repeatedly threatened in telephone calls from the Ministry of Intelligence, who said they would hold Shidhrokh (a youth, no specific age is given) hostage until another daughter, Golrokh ( گلرخ فیروزیان ) presented herself to the Ministry of Intelligence in Semnan. If she failed to do so, not only would her sister be held in detention, the security of the family in Semnan “could not be guaranteed.” However Golrokh does not live in Semnan, but in Tehran, 200 kilometres away. She wrote a letter to the Prosecutor in Semnan, giving her address and telephone number in Tehran. On March 5, three security officers from Semnan arrived at her home in Tehran, with a warrant for her arrest, but since she was not at home they had to leave. Since February 12, when the homes of the Fanaeyan and Firuzeyan families were searched and a computer and religious books and some photographs and personal effects were confiscated, and Ardeshir Fanaeyan ( اردشیر فناییان ) and Shidrokh Firuzeyan were arrested, there has been no indication of why the Ministry of Intelligence is interested in these three Bahai youths. In an unprecedented step, security agents in Semnan, with the approval of the Ministry of Education in Semnan, arrested four Baha’i students without the knowledge of their families. The agents went to two high schools in Semnan, Shahid Beheshti and Amir Kabir, and arrested four high school students in the middle of the school day: Sina Fenaeyan (سینا فناییان), Armin Allah Vardi (ارمین الله وردی), Ramin Amiri ( رامین امیری) and Yunes Khanjani (یونس خانجانی). The four were removed from school in the middle of a lesson, arrested and taken to Intelligence headquarters. They were held and interrogated for several hours and interrogated. They were asked to tell the interrogators whatever they knew about Ardeshir Fenaeyan (اردشیر فناییان), a Bahai who was arrested in Semnan on February 12. They were also encouraged with threats and promises to spy on the Bahais of Semnan. When the children did not return home from school, their parents went to the school and the school principal, after some evasion, told them what had happened. The children were released following their interrogation. On February 25, at least nine shops in which Bahais were active, in the city of Bandar Torkaman (n Golestan province, on the Caspian coast) were closed by the authorities, citing “trading violations.” Papers referring to this were posted on the shop doors. The shops taxes and fees have been paid, yet inquiries to the authorities have been fruitless. The relevant authorities have not provided any specific reasons, and say they are not responsible for the closures. Most of the businesses are cloth retailers. Under Iran’s religious apartheid system, Bahais are banned from working in many economic sectors, such as education, government employment and foodstuffs, but Bahai shopkeepers have been active in this economic sector for more than 20 years, without this being considered a trading violation. In recent years, and especially in recent months, numerous Bahai businesses in cities such as Semnan, Shiraz and Hamadan have been closed by the local authorities. The Universal House of Justice has addressed a letter to the Baha’is of Iran, which has been released in both Persian and English versions. It sets out “the posture held by Baha’is everywhere towards political activity,” within the framework of a vision statement on Baha’i views of the future of humanity. As such it is of interest also to Bahais around the world, and also to the diverse individuals, organisations and religious communities with whom the Bahais join to realize common ideals. I have placed the plain text of the English version in the documents archive section of my Bahai Studies blog. For some months, Bahai prisoners in Mashhad have been denied the normal furlough, although the prison warden has approved it, because of opposition from the Ministry of Intelligence. Iranian law states that prisoners who have served more than half of their sentences may benefit from furlough. Rozita Vatheqi ( رزیتا واثقی ), Davur Nabilzadeh ( داور نبیل‌زاده ), Jalayer Vahdat (جلایر وحدت) and Sima Eshraqi (سیما اشراقی) who are serving 5-year sentences, and Vasanaz Tafazzoli (وساناز تفضلی) who is serving a 6-year sentence, all satisfy this requirement, but have not been granted leave because of opposition from the Ministry of Intelligence. As previously reported, on November 17, 32 businesses linked to Bahais in Hamadan Province were closed down by the authorities without any explanation. Following this, the owners and tenants of these businesses went to the local authorities to ask for the reason, and were told that they could re-open if they agreed not to close on the Bahai holy days. There are eleven holy days, commemorating significant historical events, in the Bahai calendar: on nine of these, normal work is suspended. In the Islamic lunar calendar, November 16 and 17, 2012 were Muharram 1 and 2, when Bahais in countries using that calendar celebrate the births of the Bab and Baha’u’llah, and close their businesses. Three months later, the businesses remain closed, and there has been no progress towards a resolution. Because Bahais in Iran are excluded from employment by the government and from many economic sectors and professions, they rely heavily on small service and retail businesses to earn their livelihoods. On February 20, five armed agents from the Ministry of Intelligence detained Sana’ Ra’ufi ( سماء رئوفی ) as he was leaving his home in Sanandaj, the capital of Iran’s Kurdistan province. They did not show an arrest warrant, but took him and his car to the office of the Ministry of Intelligence in Sanandaj. His wife and father went to the Ministry’s office and found his car there, but were not able to contact him. Update February 23 Hyperactivist (a reliable database of Iran’s prisoners of conscience) reports the town as Arak, rather than Sanandaj. The two cities are 350 km apart. On February 17, Mr. Akbar Por-hoseini ( اکبرپورحسینی ) a Bahai resident of Semnan (a provincial capital in North-eastern Iran which is a particular hot-bed of anti-Bahai bigotry) was summoned to begin serving an 18-month prison sentence. He was charged with propaganda against the regime and membership of the Bahai community. He was initially sentenced to 26 months in prison on these charges, but this was reduced by the court of review. However this is the same Mr. Por-hoseini whose optician’s shop, as previously reported, was raided by security forces on November 29, 2012. The authorities not only confiscated his entire stock, valued at 2 billion rials (125,000 euros, 162,000 US dollars), he was fined 3.6 billion rials (225,000 euro, 293,000 US dollars) after a secret trial (trial in absentia). Nava Na`imi ( نوا نعیمی ), a Bahai resident of Isfahan, was arrested on February 12, when agents from the Ministry of Intelligence searched her home and seized her computer, books, and religious and personal photos. It is not known where she is being held. On January 30, agents from the Ministry of Intelligence in Urmia went to the workplace of a Bahai, Fardin Aghsani ( فردین اغصانی ), searched it and arrested him. At the same time, agents from the Ministry went to his home and searched it thoroughly and seized books and images relating to the Bahai Faith, and arrested his wife Farhnaz Maqdam ( فرحناز مقدم ). They have had one telephone contact with their families since then. Taher Eskandariyan, a Baha’i resident of Semnan who has previously been sentenced to 3 years in prison, was summoned to Semnan prison to begin his sentence on February 11. There are now 8 Bahais in the men’s section of Semnan prison. This is Mr. Eskandariyan’s second prison term. In 2010 he served 6 months in prison, on charges of propaganda against the regime (free speech). On February 12, security agents went to the homes of Ardeshir Fanaeyan and Shidrokh Firuzeyan ( اردشیر فناییان و شیدرخ فیروزیان ), searched them and confiscated a computer and religious books and some photographs and personal effects, and transferred the two to the Semnan Intelligence Ministry headquarters. Sepideh Vaziri-Pourhaqiqi and Samir Golshan ( سپیده وزیری پورحقیقی و سمیر گلشن ) have been expelled from the Kharameh campus of Payam-e Nour University because of their Bahai beliefs. They were in the fourth semester of studies in Agricultural Engineering. Six Bahai residents of Karaj who were interrogated in July 2012, following searches of their homes, have been sentenced to one year of probation each, on the charge of propaganda against the regime. Their names are given as Mehrdad Mahdavi, Ourang Mahdavi, Kamran Sabet, Afsani Majidi, Noghmeh Rezvani and Beharak Sahali ( مهرداد مهدوی، اورنگ مهدوی، کامران ثابت، افسانه مجیدی، نغمه رضوانی و بهارک ساحلی ). Seven Bahai prisoners from Gorgan and Gonbad, in Golestan province, were transferred to Rajai Shahr prison in Karaj, near to Tehran and 450 km from their homes, on December 22. They were among about 20 Bahais who were detained in a wave of arrests of Bahais in Gorgan and Minudasht on and about October 17. After some weeks in detention in Golestan, they were transferred to Evin prison in Tehran for interrogation, after which they were sent to Raja’i Shahr prison. Now, three and a half months after their arrests, they are still in “temporary” detention (without charge or trial). Repeated requests from their families to the prosecutor in Tehran, to have them released on bail, have been fruitless. The prosecutor has passed the file to the Ministry of Justice and the revolutionary court, and the revolutionary court has returned the file to the prosecutor’s office. The lawyers representing the detainees have not been able to visit their clients, and no court has heard their case. Their families have been required to travel back and forth regularly in connection with their detention. One of the seven, Kourush Ziari ( کوروش زیاری ), has a leg injury and was unable to walk at all until just a week before his arrest. At the time of his arrest he was receiving physiotherapy. Despite repeated approaches from his family, prison officials have made no move to give him medical treatment or medical leave. His family have been referred back and forth to various agencies. The other six are Siamak Sadri, Fu’ad Fahandezh, Payam Markazi, Fahrmand Sana’i, Farhad Fahandezh and Kamal Kashani ( سیامک صدری، فواد فهندژ، پیام مرکز، فرهمند ثنایی، فرهاد فهندژ و کمال کاشانی ). They are held in room 12 of block 4 of Raja’i Shahr prison. Rajai Shahr prison also ‘houses’ the seven Bahai ‘Yaran’ (national facilitators) who are now in the fourth year of 20-year sentences for their Baha’i beliefs. [update February 8] Family reports indicate that a trial date has been set, on February 13, in the Revolutionary Court of Tehran. `Adel Na`imi ( عادل نعیمی ), one of almost 20 Bahais who were arrested in early July in a wave of arrests in Tehran, Mashhad and Shiraz, has been transferred from block 350 at Evin Prison in Tehran to Raja’i Shahr prison. He suffers from diabetes. His younger brother `Afif ( نعیمی ), is also a prisoner of conscience. He is serving a 20-year sentence in Raja’i Shahr prison. The review court has reduced the sentence of 85-year-old Muhammad Hussein Nakh`i ( محمد حسین نخعی ), from three years in prison and three years suspended imprisonment, to one year in prison, plus a fine of 6 million rials (360 euros; 500 US dollars). He has been detained since May 14, 2012, and has been found guilty of propaganda against the regime in the form of teaching the Bahai Faith, and membership of the Bahai community. Sama and Sirus Sabeti ( سما و سیروس ثابتی ) have been expelled from Tabari University in Babol, because of their Bahai beliefs. Sama was in the third semester of a course in Civil Engineering, and Sirus in the 7th semester of a course in architecture. They were instructed by telephone to go to the University security office on January 10. When they did so, they were told they were barred from University buildings. They were put in telephone contact with the head of security at the university, who told them they had been expelled because of their Bahai beliefs. They returned to the university some time later to get a transcript of their results. After several attempts they were told that expelled students would not be issued with transcripts. Two other Bahai students, Shekufeh Derakhshaniyan ( شکوفه درخشانیان ) and Milad Samimi Darzi ( میلاد صمیمی درزی ) have also been expelled in the course of January. Didar Ra’ufi (دیدار رئوفی ) was released from Raja’i Shahr prison today. He has served a three year sentence for membership of the Bahai community and teaching the Bahai Faith. He was held in section 350 of Tehran’s Evin prison until he was transferred to Raja’i Shahr on August 5, 2011. On January 21, security agents went to the home of Shayda Ta’id ( شیدا تائید ), a Bahai in in Nur County, Mazandaran, searched it, and arrested her and her guest, Bayan Baba’i ( بیان بابایی ) from Qaemshahr. They were taken to the Ministry of Intelligence in Sari, and three days later were allowed to contact their families. On November 6, 2010, the home of Shayda Ta’id and her mother, Fariba Ta’id ( فریده تایید ), was searched by the Ministry of Intelligence, and on November 20, 2010, they were arrested by the Ministry of Intelligence. They were both released in early December, 2010. Intelligence agents in Gonbad-e Qabus in North-eastern Iran have arrested three Bahais, and sought to arrest a fourth who was not at home when the raid occurred, on January 20. Those arrested were Vathaq Sana’i ( وثاق سنایی ), Beyta Hedayati ( بیتا هدایتی ) and Hana Kushkabaghi ( هنا کوشکباغی ). The fourth arrest warrant was for Nahid Mahmoudi ( ناهید محمودی ). Sina Aqdasi ( سینا اقدسی ), a Bahai from Tabriz who was arrested in his work place by agents of the Ministry of Intelligence on December 4, 2012, was released on bail on January 17. Before his arrest, his house was searched and all the books and images relating to the Bahai Faith were taken. On the morning of January 8, 13 groups of security agents, of 7 men each, searched 13 Bahai homes in the town of Qorveh, in Kurdistan province. They had search warrants, although these were hand written and lacked the proper seal. They even searched the refrigerators and ventilator ducts, and seized religious books and images, mobile phones, cameras, computers and laptops. The names of the Bahais whose homes were searched are Khalil Eqdameyan ( خلیل اقدامیان ), Kambiz Eqdameyan ( کامبیز اقدامیان ), Sa`id Mansouri ( سعید منصوری ), Behnam Eqdameyan ( بهنام اقدامیان ), Mehrdad Zara`i ( مهرداد زارعی ), Tayeb Salehi ( طیب صالحی ), Fa’ez Salehi (فائز صالحی), Mehdi Leqa’i ( مهدی لقایی ), `Atal-llah Kothari ( عطا الله کوثری ), Zia’ullah Kothari ( ضیاالله کوثری ), Keyvmarth Awsafi ( کیومرث اوصافی ), Koroush Awsfi (کوروش اوصافی) and Sa`id Khadem ( سعید خادم ). Dr. Fu’ad Moqaddam ( فؤاد مقدم ), a Bahai from Isfahan and one of the teachers of the Bahai Institute for Higher Education (BIHE), reported to Evin Prison in Tehran on January 3, to begin serving his 5-year sentence. He was arrested in Isfahan on May 22, 2011, when Ministry of Intelligence agents entered the homes of at least 30 of the academic staff of the BIHE, seizing books, computers and personal effects. A total of 16 educators were arrested. Dr. Fu’ad Moqaddam was held for 35 days before being released on bail. On August 23, 2011, 35 social activists who were hastening with aid to the areas in Eastern Azerbaijan affected by the recent earthquake, were arrested. They included five Bahais: Navid Khanjani, Shayan Vahdati, Mithaq Afshar, Farid Ruhani and Vahid Khalus ( نوید خانجانی، شایان وحدتی، میثاق افشار، فرید روحانی و واحد خلوصی ). A court in Tabriz has sentenced Hamid Masibiyan ( حمیدرضا مسیبیان ) to two years and six months, Behrouz `Alavi (بهروز علوی ) to two years and three months, and Seyyid Husayn Raunaqi-Mulki ( سیدحسین رونقی ملکی ) and Behram Shoja`i ( بهرام شجاعی ) to two years in prison for their part in the aid effort. 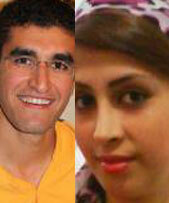 Fifteen others were sentenced to six months, including two Bahais: Shayan Vahdati, Farid Ruhani. All those sentenced were sentenced for assembly and collusion to commit crimes against national security. Officials had previously accused them of propaganda for the Bahai Faith and Wahhabi Islam, spying for foreign media and distributing spoiled food. Shahin Negari (امان الله مستقیم و شاهین نگاری), one of the teachers of the Bahai Institute for Higher Education (BIHE), was detained in Tehran on January 12. Security agents went to his home and arrested him, presumably to begin serving his sentence, as he has been sentenced to 4 years in prison. He has been free on bail since June 28, 2011. His whereabouts are not known. Shekufeh Derakhshaniyan ( شکوفه درخشانیان ), a student in the seventh semester of a Bachelor’s degree in interior design at Tabari University in Babol was expelled on January 5, because of her Bahai beliefs. As previously reported, a fellow-student, Milad Samimi Darzi ( میلاد صمیمی درزی ), who was in the fifth semester of the same course, was expelled on the same day. Shekufeh Derakhshaniyan received a summons from the head of university security on January 1, and when she went to the education department on January 5, she was informed that in accordance with a letter that the university had received, she and her cousin Milad Samimi Darzi were being expelled because of their Bahai beliefs, and that no written evidence of their expulsion would be provided, and their study results would not bear the university’s stamp or signature. She had been recognized as an outstanding student, with the highest grades among her fellow-students. Ramin Shahryari ( رامین شهیاری ) was arrested with his brother Farzin in Eslamshahr, in Tehran province, on October 21 and taken in handcuffs to Evin Prison in Tehran. They had been summoned to the Revolutionary Court and were arrested when they responded. In the 3 months since then, he has only been permitted to contact his family once, when he telephoned to say he was in block 209 in Evin prison. `Adel Na`imi ( عادل نعیمی ), one of almost 20 Bahais who were arrested in early July in a wave of arrests in Tehran, Mashhad and Shiraz, has been held in solitary confinement in block 209 of Evin prison in Tehran since his arrest. He has not been moved to the general wing, in block 350, where prisoners of conscience are held. He suffers from diabetes. His younger brother `Afif ( نعیمی ), is also a prisoner of conscience. He is serving a 20-year sentence in Raja’i Shahr prison. Shekiba Vahdat ( شکیبا وحدت ), a Bahai resident of Babolsar, has been arrested, released, and arrested again. She was summoned to the Ministry of Intelligence in Babolsar on January 1, and held for two days. While she was detained, her home was searched and some personal effects were seized. She was arrested again on January 11, this time in Tabriz. There is no information about her condition or whereabouts. Anisa Fana’ayan ( انیسا فناییان ), a Bahai resident of Semnan, has been summoned to Semnan prison on January 19, to begin her sentence of 22 months. She was charged with propaganda against the regime and participation in the Bahai administration. Her husband, Siamak Iqani ( سیامک ایقانی ) has served over 18 months of a 3-year sentence in Semnan prison. The couple have two children, aged 4 and 9. There is still no news of the whereabouts or charges against Farshid Dadvar ( فرشید دادور ), who was arrested in Zahedan on December 23. Milad Samimi Darzi ( میلاد صمیمی درزی ), who was in the fifth semester of a degree in interior design at Tabari University in the city of Babol (formerly known as Barforush), in Mazandaran province, has been expelled because of his Bahai beliefs. On January 1, he was summoned to the university’s security office where his student card was taken from him, and he was barred from the university premises. On January 5, two days before the end of term examinations, he was again summoned to the university security office where, after two hours of waiting in the vestibule, his expulsion from the university was communicated to him verbally. When he insisted on a more official statement and explanation, officials told him it was due to his bad attitude, and he was denied permission even to say farewell to his classmates. When he asked for the copies of his results, officials told him the pages would not have the stamp or signature of the university. Egypt’s Minister of Education, Ibrahim Ghoneim, told Akbar Al-Youm newspaper that Bahais cannot enroll in public schools in Egypt, saying it would violate the Constitution. 85-year-old Muhammad Hussein Nakh`i ( محمد حسین نخعی ), who has been detained since May 14, 2012, has been denied the right to use the telphone and receive visits in prison, for no apparent reason. He was arrested in the small town of Khusf, and is imprisoned in Birjand, a provincial capital close to the Afghan border. Although he requires constant medical care due to his age, and his relatives live in Tehran, family visits and telephone calls have not been allowed for some time. He has been found guilty of propaganda against the regime in the form of teaching the Bahai Faith, and membership of the Bahai community, and sentenced to three years in prison and three years suspended imprisonment, and this sentence has been confirmed by the review court. Update, January 11. HRANA reports that the ban on telephone calls and visits has been lifted, but prison officials are still not taking his advanced age into account, and he suffers rude and disrespectful behaviour.